A pro forma balance sheet summarizes the projected future status of a company after a planned transaction, based on the current financial statements. In business, pro forma financial statements are prepared in advance of a planned transaction, such as a merger, an acquisition, a new capital investment, or a change in capital structure such as incurrence of new debt or issuance of equity. Pro forma figures should be clearly labeled as such and the reason for any deviation from reported past figures clearly explained. warranties: In business and legal transactions, a warranty is an assurance by one party to the other party that specific facts or conditions are true or will happen. The other party is permitted to rely on that assurance and seek some type of remedy if it is not true or followed. intangible assets: Intangible assets are defined as identifiable non-monetary assets that cannot be seen, touched, or physically measured. They are created through time and effort, and are identifiable as a separate asset. a merger, an acquisition: Mergers and acquisitions (abbreviated M&A) is an aspect of corporate strategy, corporate finance, and management dealing with the buying, selling, dividing, and combining of different companies and similar entities that can help an enterprise grow rapidly in its sector or location of origin, or a new field or new location, without creating a subsidiary, other child entity or using a joint venture. In business, pro forma financial statements are prepared in advance of a planned transaction, such as a merger, an acquisition, a new capital investment, or a change in capital structure such as incurrence of new debt or issuance of equity. The pro forma models the anticipated results of the transaction, with particular emphasis on the projected cash flows, net revenues and (for taxable entities) taxes. Consequently, pro forma statements summarize the projected future status of a company, based on the current financial statements. For example, when a transaction with a material effect on a company’s financial condition is contemplated, the Finance Department will prepare, for management and Board review, a business plan containing pro forma financial statements demonstrating the expected effect of the proposed transaction on the company’s financial viability. Formally, shareholders’ equity is part of the company’s liabilities: they are funds “owing” to shareholders (after payment of all other liabilities). Usually, however, “liabilities” is used in the more restrictive sense of liabilities excluding shareholders’ equity. The balance of assets and liabilities (including shareholders’ equity) is not a coincidence. Records of the values of each account in the balance sheet are maintained using a system of accounting known as double-entry bookkeeping. In this sense, shareholders’ equity by construction must equal assets minus liabilities, and are a residual. Lenders and investors will require such statements to structure or confirm compliance with debt covenants such as debt service reserve coverage and debt to equity ratios. Similarly, when a new corporation is envisioned, its founders will prepare pro forma financial statements for the information of prospective investors. Pro forma figures should be clearly labeled as such and the reason for any deviation from reported past figures clearly explained. Balance sheet analysis is process of understanding the risk and profitability of a firm through analysis of reported financial information. Balance sheet is a summary of the financial balances of a sole proprietorship, a business partnership, a corporation or other business organization. Assets, liabilities and ownership equity are listed as of a specific date, such as the end of its financial year. Balance sheet analysis (or financial analysis ) the process of understanding the risk and profitability of a firm (business, sub-business or project) through analysis of reported financial information, particularly annual and quarterly reports. Financial ratio analysis should be based on regrouped and adjusted financial statements. Two types of ratio analysis are performed: 3.1) Analysis of risk and 3.2) analysis of profitability. Balance sheet analysis consists of 1) reformulating reported Balance sheet, 2) analysis and adjustments of measurement errors, and 3) financial ratio analysis on the basis of reformulated and adjusted Balance sheet. In financial accounting, a balance sheet or statement of financial position is a summary of the financial balances of a sole proprietorship, a business partnership, a corporation or other business organization. Assets, liabilities and ownership equity are listed as of a specific date, such as the end of its financial year. A balance sheet is often described as a “snapshot of a company’s financial condition”. Of the four basic financial statements, the balance sheet is the only statement which applies to a single point in time of a business’ calendar year. A business operating entirely in cash can measure its profits by withdrawing the entire bank balance at the end of the period, plus any cash in hand. However, many businesses are not paid immediately; they build up inventories of goods and they acquire buildings and equipment. In other words: businesses have assets and so they cannot, even if they want to, immediately turn these into cash at the end of each period. Often, these businesses owe money to suppliers and to tax authorities, and the proprietors do not withdraw all their original capital and profits at the end of each period. In other words businesses also have liabilities. 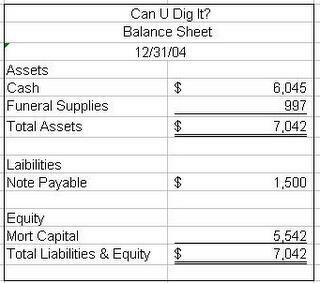 Balance Sheet: An example of a classified balance sheet. Balance sheet analysis (or financial analysis) the process of understanding the risk and profitability of a firm (business, sub-business or project) through analysis of reported financial information, particularly annual and quarterly reports. Balance sheet analysis consists of 1) reformulating reported Balance sheet, 2) analysis and adjustments of measurement errors, and 3) financial ratio analysis on the basis of reformulated and adjusted Balance sheet. The two first steps are often dropped in practice, meaning that financial ratios are just calculated on the basis of the reported numbers, perhaps with some adjustments. Financial statement analysis is the foundation for evaluating and pricing credit risk and for doing fundamental company valuation. 3.1) Analysis of risk typically aims at detecting the underlying credit risk of the firm. Risk analysis consists of liquidity and solvency analysis. Liquidity analysis aims at analyzing whether the firm has enough liquidity to meet its obligations when they should be paid. A usual technique to analyze illiquidity risk is to focus on ratios such as the current ratio and interest coverage. Cash flow analysis is also useful. Solvency analysis aims at analyzing whether the firm is financed so that it is able to recover from a losses or a period of losses. “The objective of financial statements is to provide information about the financial position, performance and changes in financial position of an enterprise that is useful to a wide range of users in making economic decisions. ” Financial statements should be understandable, relevant, reliable and comparable. Reported assets, liabilities, equity, income and expenses are directly related to an organization’s financial position. Owners and managers require financial statements to make important business decisions that affect its continued operations. Financial analysis is then performed on these statements to provide management with a more detailed understanding of the figures. These statements are also used as part of management’s annual report to the stockholders. Government entities (tax authorities) need financial statements to ascertain the propriety and accuracy of taxes and other duties declared and paid by a company. Media and the general public are also interested in financial statements for a variety of reasons.